Tuesday’s weather brought with it heavy rain, hail and at least two confirmed tornadoes in Ford County. 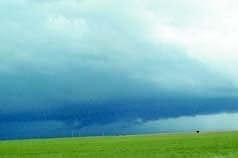 Larry Ruthi, meteorologist at the National Weather Service said that storm spotters had confirmed a tornado had touched down around 2:40 p.m. about 7 miles southwest of Dodge City and reported that it was heading south at a slow rate of speed. However, no major damage resulted from the tornado. Ruthi said the tornado only lasted between 35 to 45 seconds and touched down in an open field. “Little to no damage is expected,” he said. The storm then dissipated into a rainstorm. The second came about an hour later at 3:45 p.m., when another small tornado briefly touched down southwest of Windthorst. Meteorologist Jennifer Ritterling said the National Weather Service had not received any notice of damage from the second tornado. Along with the tornadoes, large amounts of rain were dumped across the area in a 30-minute span. Dodge City received 1.73 inches of rain between 3 and 3:30 p.m., while the largest report came from north of Howell with an estimated 2.3 inches.